Fridia was not born at the shelter; in fact, she was born to a very loving and nurturing mother. However, her mother was owned by a not-so-nice Neopian that did not care much about anything but himself. The mother Lenny tried very hard to hide her daughter for her over-lord owner, but soon, the baby was discovered, and as soon as it was old enough, the evil owner took the baby to the pound, and without even saying a word to the pound staff, he left the baby Lenny in a small box outside, in the rain. It was very lucky that the pound staff found the baby that night while they were closing the pound for the night. Or else, no one knows what would have happened. At first, the baby was scared, and constantly cried for her mother, but her mother never came for her. But the young Lenny knew it wasn't her fault; she knew that the evil owner would never let her mother come rescue her. And so the baby Lenny decided that she would focus her time on trying to find a new home for herself; many days and nights passed, and no one so much as peeked into her little cage at the pound. The young Lenny was beginning to grow scared once more; she wasn't sure what would become of her in this place. The young Lenny began to realize, that sadly, she might not find herself a new home as soon as she had thought she would. So she would sit for hours in her cage, alone, thinking about her mother; she remembered that her mother was very smart, and how she loved to read; and so the baby began to recall the stories that her mother had told her, the many facts and secrets that her mother had filled her head with. These things made the baby feel safe and protected. 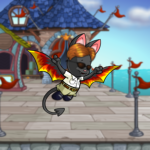 After the young Lenny had been in the shelter for a couple of months, a young Neopian moved into town. This Neopian was a young girl of eighteen, she was looking to start a life of her own, and was looking for a way to pay her bills, so she got a job at the shelter. The girl, whose name was Devey Rae, worked five days a week and spent most of her time with the baby Neopets, taking care of them; feeding them, bathing them, reading them stories, and playing games with them. The young Lenny loved to hear Devey's stories, although the Lenny never left her cage to play with the Neopian, as she was very wary of Neopians now. The Lenny didn't know this, but Devey had been watching her, and waiting for her to come out of her cage. 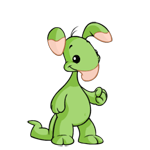 Devey hadn't said anything, but she thought that the young Lenny was one of the most beautiful and darling Neopets she had ever seen. And so each day, she would work with the baby Neopets, who were all so cute and adorable, and read to them, and cuddle them, and give them love, until one day, they would be adopted, and taken to their new homes, where their new owners would give them love as well. Devey secretly hoped no one would adopt the little Lenny, because she wanted to adopt the little one herself, but she wasn't sure if the little Lenny liked her or not. 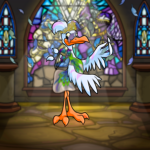 One day, Devey came into work, and greeted all of the Neopets as usual, she stopped at each of the cages and said good morning; when she got to the Lenny's cage, she stopped a little longer, and said, "Hello there, beautiful, how are you today?" Devey smiled the sweetest smile she had and waited for a response. "Hello..." came a weak voice from the back of the cage, and the young Lenny moved toward the front of the cage. Devey stuck her hand through the bars and began to gently stroke one of the Lenny's wings. "Do you want to come out today, and hear a special story?" asked Devey. The little Lenny's beak broke into a small but eager smile and she nodded forcefully, so forcefully that the little feathers on the top of her head shook about. This made Devey giggle. "Okay, honey, one minute." And Devey unlocked the cage, and for the first time, she held the little Lenny in her arms, and at the same time, both the Neopian and the Neopet felt that this was where they both belonged. One week later, the adoption was finalized, and Devey brought the little Lenny home to live with her. Devey had worked hard to make her house ready for the new arrival, knowing of the Lenny's passion for reading and learning. Devey had invested quite a bit of Neopoints in a study/library for the baby. "I thought you might want someplace quiet to read," Devey said as she was showing the little Lenny around the house. The little Lenny wobbled into the study and found a cozy place to sit on some pillows that Devey had bought for her. On the top of one of the pillows, there was a small red box. The box had a beautiful blue silk ribbon tied into a bow on top of it. The little Lenny didn't want to touch it; it was so wonderful to look at. "Aren't you going to open it, honey?" Devey asked. The little Lenny looked from the box to Devey, and back to the box, then with a huge smile, she seized the box in her little wings and tore the ribbon off and opened the box. The first thing the little Lenny saw was a red heart attached to a black silk collar. The little Lenny was so excited that she forgot to read the name on the heart. She was staring intently at the beauty of the little heart and of the silk collar it was attached to. "Oh, I love it so much!" exclaimed the little Lenny. She took the collar out of the box and rushed over to Devey. "Will you put it on for me?" she asked. Devey laughed and took the collar from the baby. "Sure" she said as she tied the collar around the Lenny's neck. "Did you read the tag?" Devey asked. The little Lenny looked confused at first, and then looked panicked. "Oh no! I forgot! What does it say?" the little one exclaimed. "It says," said Devey, "Fridia Rae." "My name is Fridia?" the little one said in amazement. "Yes, is that okay?" Devey seemed unsure. "That's wonderful!" shouted Fridia, and she jumped into Devey's arms. Devey laughed. The little feathers on top of Fridia's head were flopping all around again. "Tomorrow, we are going to go by the book store, and buy you some more books, and how would you like something to write in?" Devey asked. "Something to write in?" Fridia seemed puzzled. "Why would I need something to write in?" she asked. "Well, Fridia, I just recently got a new job. I am going to be traveling Neopia, writing articles about all the fun and exciting places that exist here, and since you are coming with me, I thought you would want something to write all your adventures in," Devey said softly and with a matter-of-fact tone. "I know you are a very smart little Lenny, and that you will want to write down everything you see, hear, smell, taste. I know you, Fridia." Devey smiled and ruffled Fridia's head feathers. "I would love something to write in!" Fridia exclaimed. The next day, when Fridia and Devey arrived in the bookstore in Neopia Central, they were greeted by a friendly blue frog looking Neopet. He was sitting in the back of the store, reading one of the many books he had for sale. "Can I help you two?" he asked. "Yes, we are looking for some books my Lenny, Fridia here, and for a notebook or journal for her as well," Devey explained. "Fridia, huh? What an exquisite name! I have heard nothing like it before," he said with a grin. "Now, if it is adventure books you are after, that section is over there; if you want romance, that section is here." The frog went on to explain the different genres of books and where to find them in the store. "And for the journals, on the back wall," he ended with a smile and then went back to his book. Devey and Fridia wandered back to the journals first. The first journal that little Fridia saw, she knew she had to have. It was a thick journal with hundreds of crisp, golden pages; its cover was a big leaf. The leaf was sparkling, as if possessed by magic. Fridia picked up the beautiful book, and indeed just like magic, her name appeared on the journal's cover, written in beautiful golden lettering. Fridia looked up at Devey, and smiled. "Oh please, oh please, oh please! I want this to be the book I write all our adventures in, Mom!" Fridia had the biggest, most beautiful smile on her face.